ABT UNK: Those Places Thursday: Ainslie Court Apartments in Portland, Oregon - Designed by Ewald Pape? Those Places Thursday: Ainslie Court Apartments in Portland, Oregon - Designed by Ewald Pape? "At a cost of $20,000 a six-suite, three-room bungalow-court will be erected at East Twenty-first and East Madison streets, by R. S. McFarland, from plans by E. T. Pape." Figuring out exactly where this is has been tricky, and I'm still not sure I have the right location. I used a number of websites brought to my attention by Val C. Ballestrem, Education Manager at Portland's Architectural Heritage Center, whom I met with one morning during my visit. 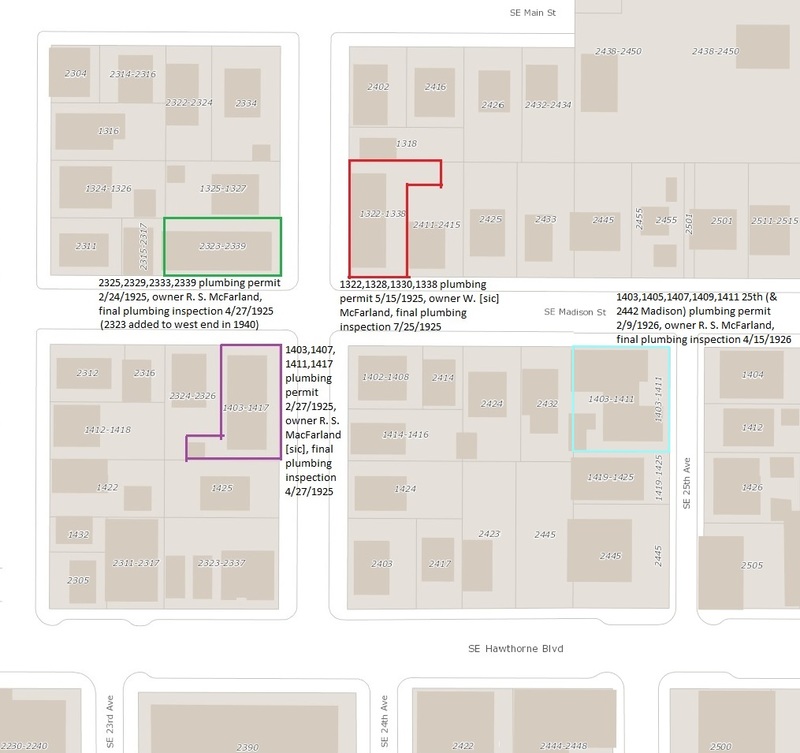 The City's property information database, PortlandMaps, has scanned historical plumbing permits. These show the original owner (but unfortunately, not the architect) and can give a rough date for construction. Sometimes subsequent owners or other changes are shown with additional permits for plumbing revision work. The Oregon Historic Sites Database can be used to check addresses to see if they are listed on or were nominated for the National Register of Historic Places. 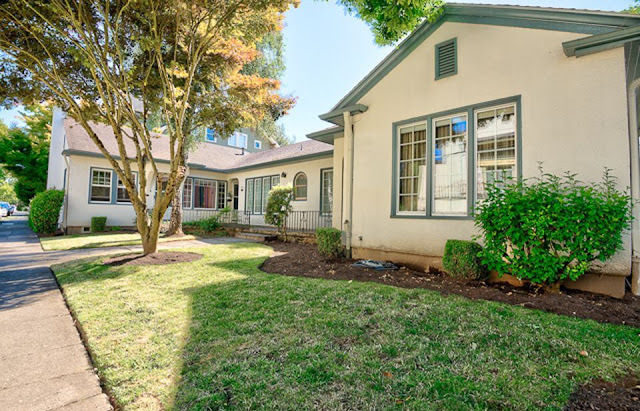 You can search by a number of criteria, including address and architect (but I quickly learned the architect is often NOT listed on National Register paperwork). You can also pull up a copy of the National Register paperwork as well as the City of Portland Historic Resource Inventory sheets, if applicable (there's also a spreadsheet with all the information from the latter). Like Chicago, Portland underwent an extensive street address renumbering, but in the 1931-1933 time period. PastPortland can be used to convert current addresses to those before the transition, or vice-versa - old addresses into today's. You can also download a PDF of the renumbering information, as well as a PDF with street name changes over the years. Here is the February 9, 1926 plumbing permit for the building, clearly showing six units. The date dovetails well with the newspaper article, and the owner of the building is shown to be R. S. McFarland. 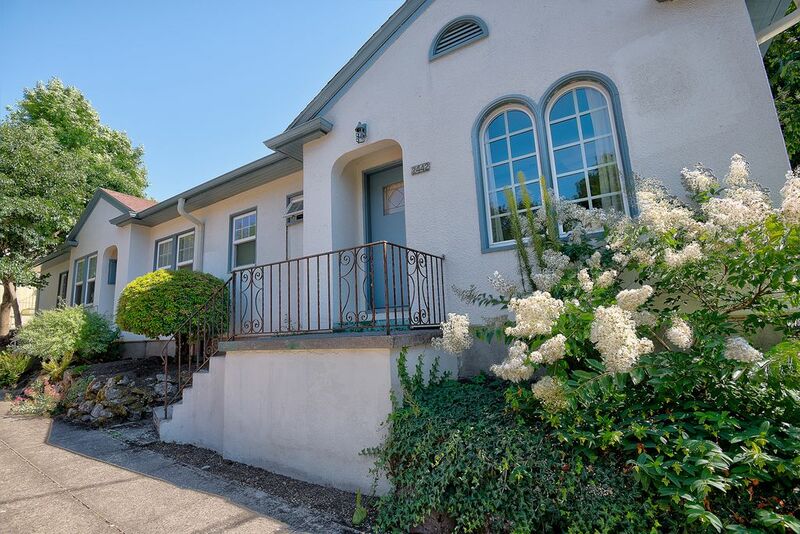 The Portland Historic Resources Inventory notes that the building is English Cottage style garden apartments with primarily stucco siding. Special features include a low gable roof with returns on gable ends, projecting gable pavilion entrances, and multi-pane windows. 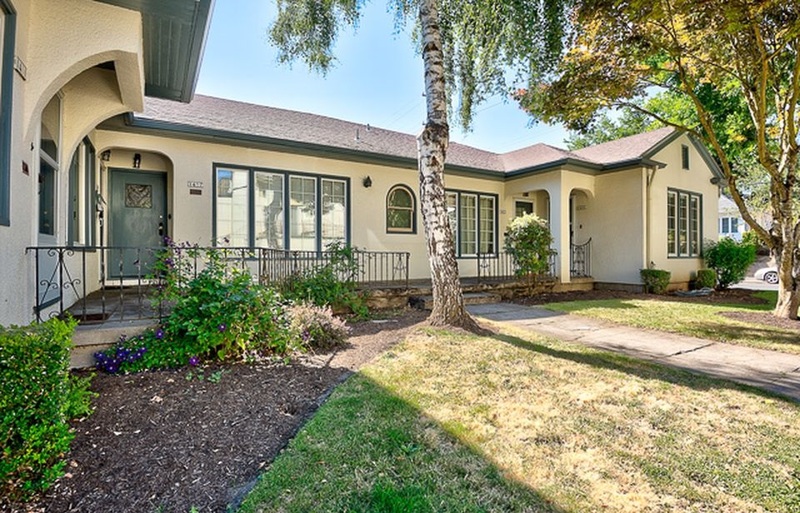 Recent real estate listings (rentals and sales) note hardwood floors. The six units are each one-bedroom, one-bath (along with a living area and kitchen) and around 700 to 750 square feet. 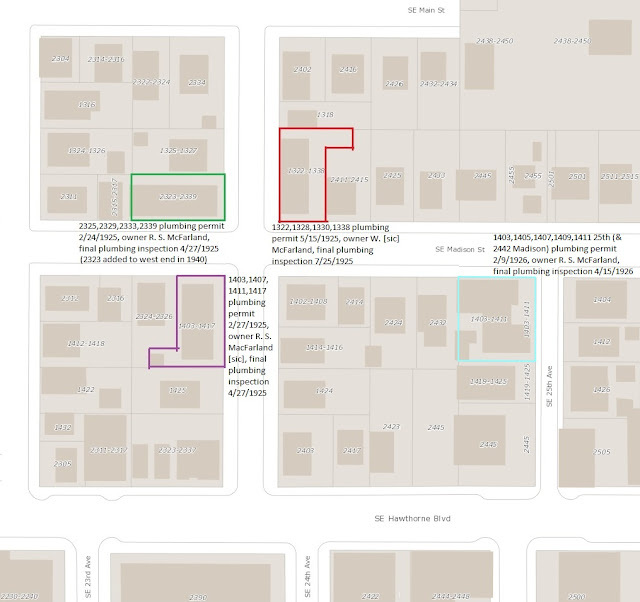 Below is a map (click on it to make it larger) showing the location of the Ainslie Court Apartments (outlined in blue on the right) along with three nearby apartment buildings originally owned by McFarland. More on those in a future post - Ewald definitely designed two of those. The details of Ainslie only differ from the newspaper article with the cross street of [South-]East 21st rather than 25th. There is a possible property near that point, but I think it's another apartment complex referred to in yet another newspaper article that may *also* have a misprint on the street names. But more about that in the future too.